Rhode Island | Where is Paperwoman? 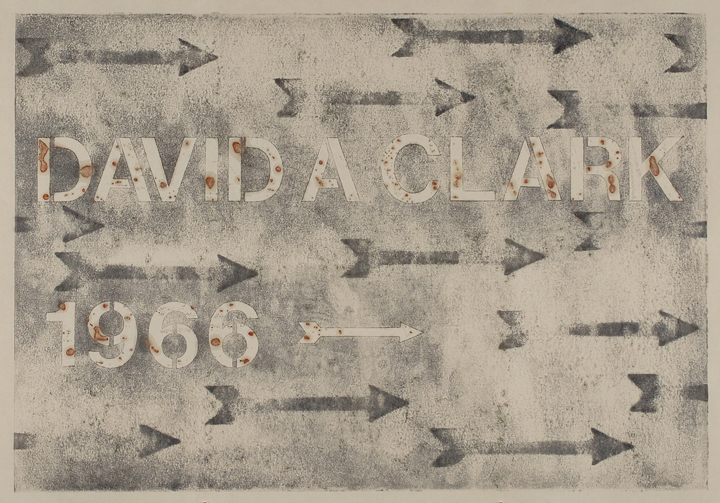 We are rounding out 2014 with an interview with artist David A. Clark, who, much to our delight, paid us a visit to our warehouse and showroom ! We enjoyed the visit, especially as things wind down as the year closes out. 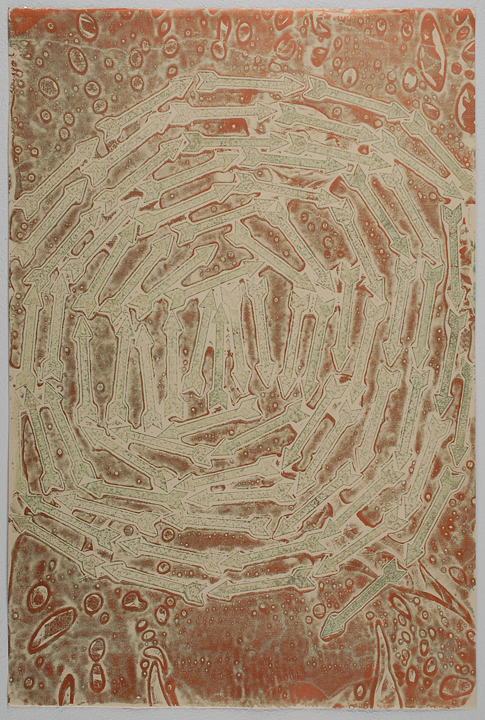 His perspective on handmade paper and printmaking gave us a renewed outlook as we focus on our goals for 2015. As you muse over yours, please enjoy his interview and images of his work. Thanks, David, it truly was our pleasure! PCI: What kind of artwork do you do? DAC: I’m really interested in the idea of trajectory and impulse and the way those two abstracts influence one’s direction, thought and the way we, as human beings, move, act, think and feel as a result of their influence. My work has always been an exploration of the idea that life is a series of small impulses and trajectories strung along a larger arc. Those concepts are manifested in many different ways in my work, and for the last several years most of them have been brought to life with encaustic and paper. Lots and lots of paper. PCI: And we love to hear that! What or who has influenced/inspired you? DAC: I find inspiration everywhere, but I’m process oriented, so typically I will have an idea in my head that is amorphous, it’s usually a feeling or an impulse that is pushing me to find it a physical form and I’ll be working in my studio on a different project and some bit of what I am doing will ‘bridge the gap” between the idea and the object, and the work will begin to take shape. Honestly though, at the moment I find great inspiration in the materials that I am working with. Materials can often be the “bridge” between the ephemeral and the physical. A perfect example is when you showed me the Sakamoto paper at 7th International Encaustic Conference. I had not worked with paper like that before, but I touched it and it triggered a curious spark. So, I bought every sheet she had and it took me about a year for that paper to find the right “idea” partner to form a dance. But I knew the minute I touched that paper that I could tell a story with it and that it would be the perfect marriage with the impulses that were percolating in my head. PCI: What attracts you to working with paper? DAC: Paper is language. It holds nuance and, because I am mostly printing right now, it is the catalyst for the image. As a material, paper is so versatile. It’s ephemeral or lasting, fragile or strong, absorbent or impermeable, but the most important quality to me currently is the organic nature of paper and it’s link to a historical context. There are so many different types of paper that can tell different stories. The work that I am doing at the moment is a direct result of the alchemy of process between particular types of paper, the encaustic paint I am printing with and the ideas that are asking to be made. The body of work I am currently making is very much a collaboration with paper. PCI: We love the language analogy, as relating paper to language, semantics and cultural dialect is a part of my daily goal. 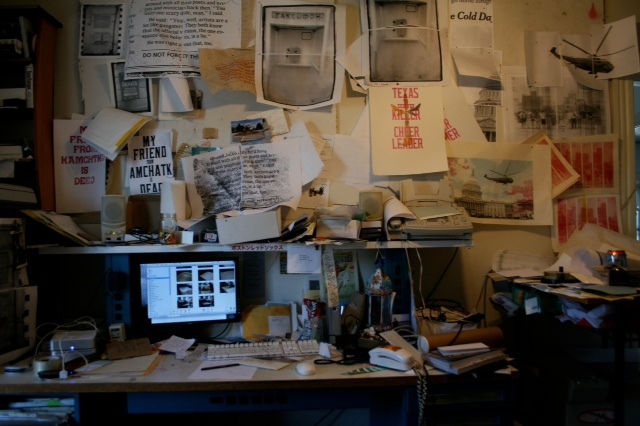 After all, paper is a surface invented to transmit information via language, as your layered artwork does so very well. What do you like best about working with paper? Have you ever made paper? DAC :I asked Catherine Nash, an artist, friend, author and expert on handmade paper, to show me how to work with high shrinkage flax last year. I loved working with the pulp and forming the sheets. I can see projects involving making my own paper at some point in the future, but for now I have my hands full with the work I am doing. I have visited some paper makers in Thailand and Cambodia, but I think a trip to Japan will be in order at some point when the ideas in my head get too big for the sheets that I am able to buy. PCI: How did you hear about our company? 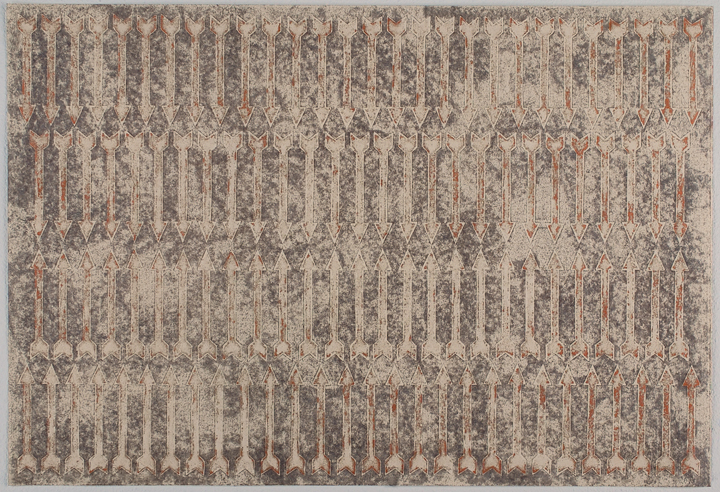 DAC: I first encountered Paper Connection International through you at the 7th International Encaustic Conference. I think I bought half of everything you had that first day. You had papers I had never seen before that had qualities that I knew would work well for me. Lauren, you have since become a good friend and a terrific resource for information. I’ll often email and ask about paper recommendations for projects. And I am really looking forward to visiting the store this fall for the first time. I have mostly been dialoguing with you at the Conference and by email, but so much of ones relationship to paper is tactile, so I am looking forward to touching everything in the store. PCI: David, thank you so much. We really appreciated that first day at the Conference, as it led to such great things! Did you have much knowledge about Japanese papers before using our papers? DAC: I have a rudimentary education in Japanese paper. Catherine Nash has been a terrific resource, and you and your staff at Paper Connection International have been a huge, huge help in illuminating and educating me in what is available. And I’m a voracious reader and researcher, so my knowledge of paper is ongoing. PCI: In what ways did Paper Connection help navigate and perhaps inform you about Japanese paper? DAC: When you introduced me to Sakamoto Heavyweight and your beautiful Kozo Natural. Those two papers form the foundation of my current work. That work would be telling a much different story without those two papers. PCI: What papers do you use of ours and for what process? DAC: Currently I’m working on a series of Encaustic Monoprints called “Ancient Histories” which is printed on Sakamoto, Sakamoto Heavyweight, Kozo Natural, and some Kitakata, Tamura Koban, Mexican Handmade, Akatosashi and Sekishu. The Sakamoto and the Kozo Natural form the backbone of the series. They are the most beautifully strong, forgiving and versatile papers. There is something unique that happens in the print process with these papers that is pure magic. PCI: What did you like about those papers that aided in your creative and/or technical process? DAC: I particularly love the velvety texture and soft, organic color of the Kozo Natural, and the two opposing surfaces of the Sakamoto, both the smooth and the more velvety, and that it comes in two different weights. 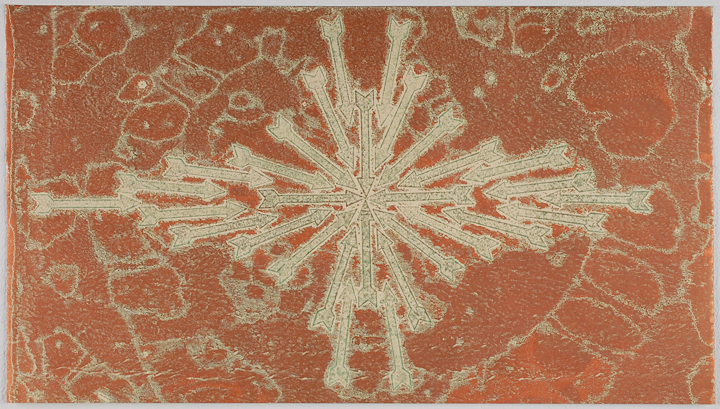 Both papers print well, but they each print slightly differently when printing with encaustic. And something particular occurs with the Sakamoto that doesn’t happen with any other paper. I like these papers so much I teach with them now. PCI: We love hearing that! What are some of the differences between our papers and others you have worked with? DC: Paper Connection carries paper that I cannot get anywhere else. DAC: I would recommend the Kozo Natural. It is such a glorious paper for encaustic printing. PCI: Good choice. Bonus question: If you could have a conversation with any artist present or past, who would it be? And would you talk about paper? DAC: I’d have a conversation with my friend Catherine Nash. She’s such a gifted artist, and I love her work and the way she thinks. Catherine wrote an amazing book about artists that work with encaustic and paper called “Authentic Visual Voices: Contemporary Paper and Encaustic”. Spending time with Catherine is like going to Mount Olympus. She has such a wealth of knowledge about paper that the whole sky opens up and one looks around and discovers that the world is made with paper. PCI: Catherine is truly is an innovator in the paper world; she is never afraid of using paper in new ways with a variety of materials. We hope that visiting Paper Connection was like going to Mount Fuji? haha… I do remember you saying it was the highlight of your trip to Rhode Island; that was pure music to my ears. Thank you again, David! I am excited to have you visit Japan; I would be thrilled to be your guide. Click on David’s website here. He is an established letterpress printer in the Providence, RI, area, teaches letterpress at RISD, unique to say the least, and our Artist of the Month for January. We wouldn’t want to start 2014 off any other way. This has been a long time coming, as we have known Dan for many years. It’s worth the wait though, as we peer into his ever tinkering, witty, quirky mind, and talk about paper! PCI: We have know you for a while, Dan, but please share with our readers and paper fans what kind of artwork do you do? What or who has influenced/inspired you? 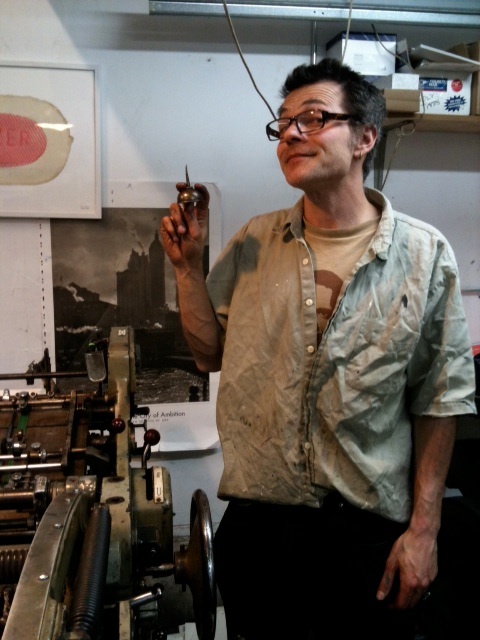 DW: I am a printer and printmaker, and run my own letterpress print shop, DWRI Letterpress in Providence, RI. The shop does commercial letterpress work, from invitations to business stationery to many, many collaborations with artists and designers. In my own prints, I make work from various sources, (found printed objects, photographs, type, etc) with ink and paper using way too many cast iron printing presses. My own work involves a lot of type, coarse halftone images, old newspapers, etc., to bring these earlier printed objects back into the mainstream. Inspiration? Pretty much everything, but as far as artists go, I always loved Saul Steinberg as a kid and adult, and also Jean Tinguely, the French sculptor who made the self destructing Homage to New York. PCI: What attracts you to working with paper? What do you like best about working with paper? DW: For paper, and prints in general, I like the fact there is a certain amount of permanence, the idea the paper once printed is now a record of that earlier process. It has some depth and dimension when printing via letterpress, but not nearly as much as the plates or type that went into making it. There is also a delicateness, and fragility, in contrast to the greasy messy machines that it is surrounded by, and somehow, they both come out ok.
PCI: How did you hear about our company, Paper Connection? PCI: We recall it was through a local stationer on the West Side….. So, back to the days before we knew about each other; how much knowledge of washi and other Asian papers did you have before using our supply? DW: A little bit, but only from a printmaking perspective with chine collé, etc…nothing like the Lokta (20×30 inches $4.00/sheet and a 3 x6 feet natural lokta @ $30.00/sheet ) or Pang Pi (45×80 inches $20.00/sheet), I like to use for my work. PCI: More on those two specific papers later. 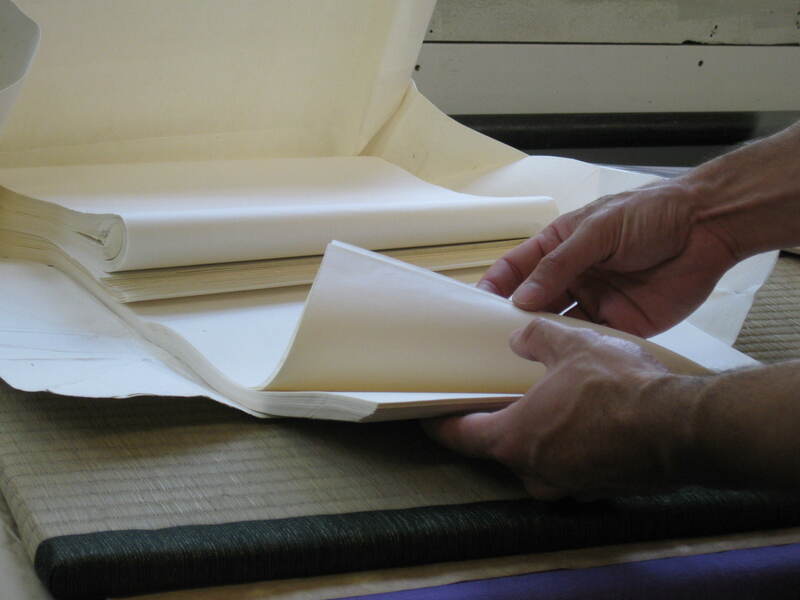 How did we help navigate and perhaps inform you about Japanese paper? DW: The most educational aspect for me is of the contemporary position of traditional paper makers and artisans in Japan and in the world, and how important it is to support like-minded artisans if indeed we value what they produce. You can feel that labor of love in the paper itself, and I am not a touchy-feely-gaga-over-paper person. PCI: And that’s okay! We really appreciate the awareness you share regarding the artistic nature of the paper makers themselves. They are truly National Treasures. Which papers do you use of ours and for what printmaking process? How do these papers interact with your take on letterpress? DW: So, the printing process I use is letterpress printing, which at its core is basically just a mechanized from of relief printing (inking a raised surfaced and pressing it onto a paper like substrate). 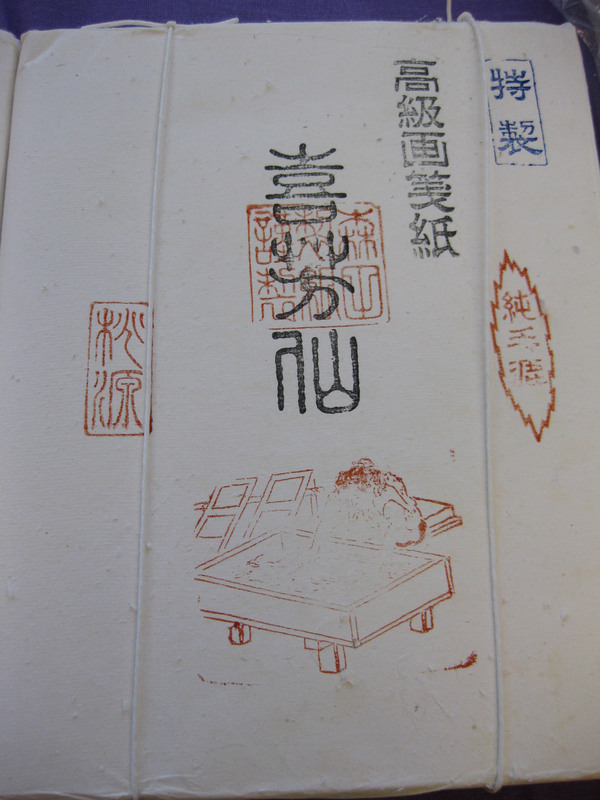 Many Japanese papers are ideally suited for this method, for use in traditional Japanese relief printing. For me, however, I gravitate to the slightly grittier papers like the Pang Pi (oversized kozo) from China (45×80 inches $20.00/sheet), and Lokta from Nepal (3×6 feet natural lokta @ $30.00/sheet. ) I like these papers as they are both available in huge sheets, and for my uses have a quality similar to the old newspapers I am referencing sometimes in my work. They both also react and hold ink exceptionally well, but have a thickness and feel not unlike the western cotton and wood based papers used in my artwork and shop. Dan using Pang Pi paper, not traditionally employed in letterpress. Dan’s work on Pang Pi, a break through for those looking for alternative papers for letterpress. PCI: What are some of the differences between our papers and others you have worked with? DW: The main stereotypical difference is that sulfite , (wood pulp), and cotton papers tend to need to be much, much thicker to be stronger sheets, while mulberry and other papers can be exceptionally strong and also super thin. They can then have a sleekness without being calendered or overtly manufactured, but still hold together. Printing with the magnificent Pang Pi, made entirely by hand. Or hands. Pang Pi hanging in a local Providence gallery. DW: I like PANG PI paper for LETTERPRESS because it IS REALLY BIG AND HOLDS BLACK INK REALLY WELL. And it is cool. PCI: Our famous bonus question: If you could have a conversation with any artist present or past, who would it be? And would you talk about paper? DW: At this point, I would be happy to talk to any artist, (or anyone really), who managed to just keep his or her cool, despite whatever pressures. That’s about it. I feel lucky to be able to work and talk crap with so many people and artists already, especially fellow letterpress and other printers – they are weird in a lot of very particular ways. See more of his art here. Jane and Francesca, two of our paperwomen, had the chance to enlighten aspiring printmakers of the future, on the beauty of washi and letterpress. A common misconception is that paper must be thick, and framed by those wonderful deckle edges we see on so many letterpress invitations. Not so, as we all discovered at the class. Just because washi is thinner, doesn’t mean it is weaker. Searching for the 8th wonder of the world on Japanese Plum Blossom Lace paper, backed. Stocked in 3 colors: pink, gray and coconut cream; 21.5×31 inches @ only $6.00/sheet at Paper Connection: 401-454-1436. Paperwoman’s letterpress printed business cards on Japanese Plum Blossom Lace Cardstock, by Dan Wood. We didn’t have to look too far to meet our next Artist of the Month: Esteban Martinez. How close? How about a next door neighbor! Rhode Island has a reputation for being small, where there exist three degrees of separation, with those degrees going down as the art scene in the Ocean State only gets stronger. As Mr. Martinez answers our famous questions, perhaps you can think of reaching out to a neighbor, business or otherwise, and see what kind of connections you can make: it’s amazing how much in common we have, simply by asking. PCI: Tell us a little about yourself and your work, Esteban. What kind of artwork do you do? What or who influenced and inspired you? 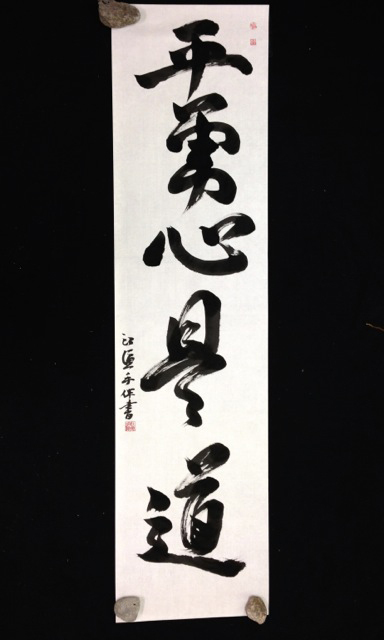 EM: Shodo, Japanese calligraphy. My main inspiration was my late Aikido teacher Fumio Toyoda Shihan. 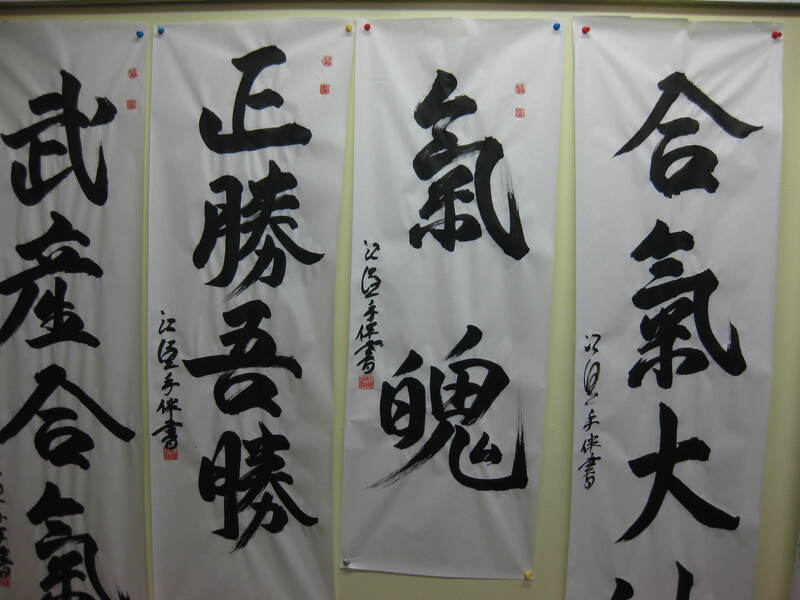 I also get inspiration from classical Zen calligraphers and martial artists. EM: Well, 50% of good Shodo is having good paper. The other 50% is skill and ink. So paper is important. How paper reacts to ink, quality, size, texture…it will all affect the end result. PCI: What do you like best about working with paper? EM: How it reacts to the ink, and the effect it produces, whether it is dry or wet spots. It all gives the calligraphy a unique feel. Esteban choosing papers at our warehouse. PCI: In turn, which your pieces manifest. How did you hear about Paper Connection International? EM: Lauren is my next door neighbor! PCI: So who says good fences make good neighbors? How much knowledge did you have of washi before using our papers? EM: Just the basics of Japanese “rice” paper for calligraphy. I didn’t really got my hands on real handmade until Lauren gave me a piece of a beautiful paper called Kihosen Kana. 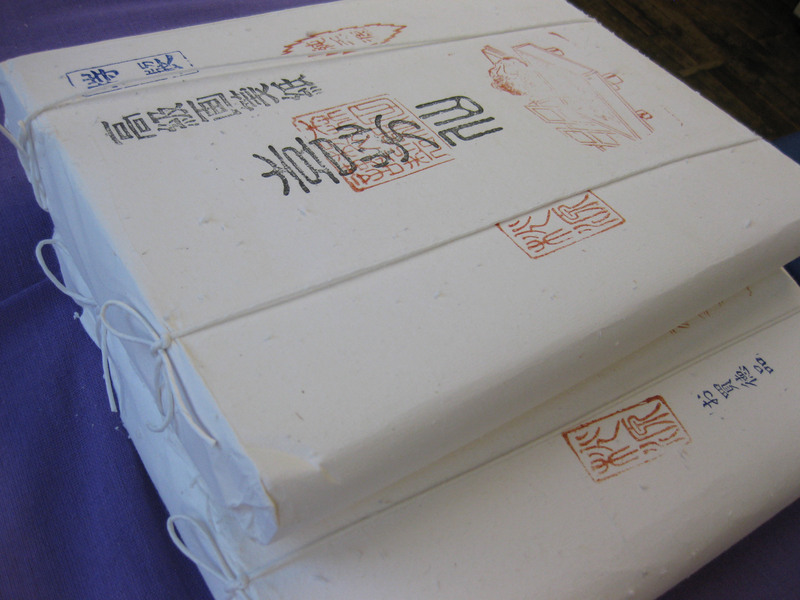 PCI: A popular misnomer that Asian papers are made of “rice” materials. We are so glad you were introduced to that gorgeous paper, made out of kozo, or Japanese mulberry. How did Paper Connection help navigate and inform you about Japanese paper? EM: Through Lauren I have been learning the differences between machine made and hand made paper, and why handmade quality paper is so much better. PCI: So what papers do you use of ours and for what process? EM: I got a whole block of Kihosen Kana handmade paper. PCI: What did you like about those papers that enhanced your creative and technical process? EM: The sumi ink flows beautifully in it and I really like how the calligraphy looks on it. PCI: Please explain some of the differences you have discovered between our papers and others you have worked with. EM: You can tell that the paper from PCI has been carefully sourced from the best places. The rest feels generic and poor quality. PCI: Based on your experience so far, what papers would you recommend to a fellow Shodo artist? EM: I like Kihonsen Kana paper for Shodo or Sumi-e because it has a beautiful texture and the sumi_ ink flows perfectly on it. PCI: I can envision the tranquility of each brushstroke as you describe that. Our famous bonus question: If you could have a conversation with any artist present or past, who would it be? And would you talk about paper? EM: I would like to have a conversation with Yamaoka Tesshu. He was a master swordsman and Japanese calligrapher. I would ask him how did he choose his paper and how he mounted them on scrolls. PCI: What a combination of skills! Surely that would be an enlightening conversation. Thank you so much, Esteban, for your time, and your support of Paper Connection International. We really appreciate it. And thank you for being such a nice neighbor! To find out more about Esteban Martinez, please visit his website: Gohitsu Shodo Studio, where you can also fan his Facebook page and see what he’s up to on YouTube. I totally chilled to the background music while watching him at work. A great way to get inspired! 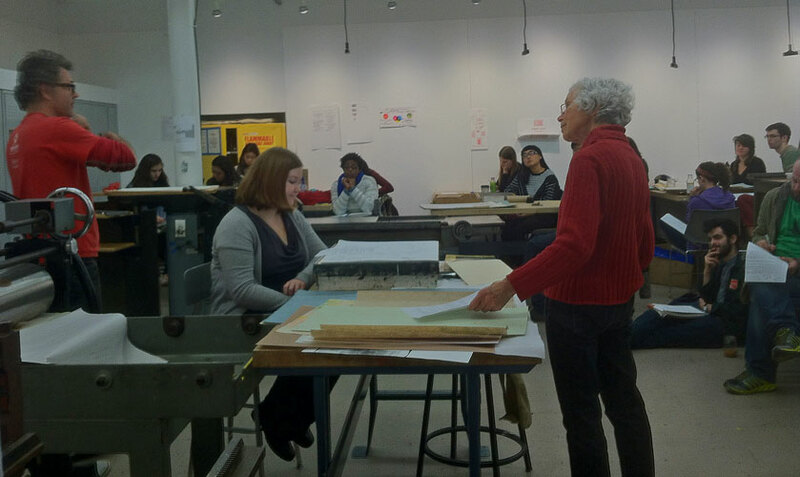 Paperwoman stayed local last week as she had the opportunity to take a tour of the book conservation lab and bindery at Brown University’s John Hay and Rockefeller Libraries through the Watts Program. Here’s some quick glimpses of what was she saw, including an ancient Ethiopian hand-scribed, Christian manuscript with coptic binding, a wonderful piece of ephemera of P.T. Barnum’s Rarities, some very cool tools and beautifully aged books and other learning tools. Jacques sheers-big as a bed! Japanese paper cover-almost looks like leather. You knew we now stock hanji at Paper Connection; right? 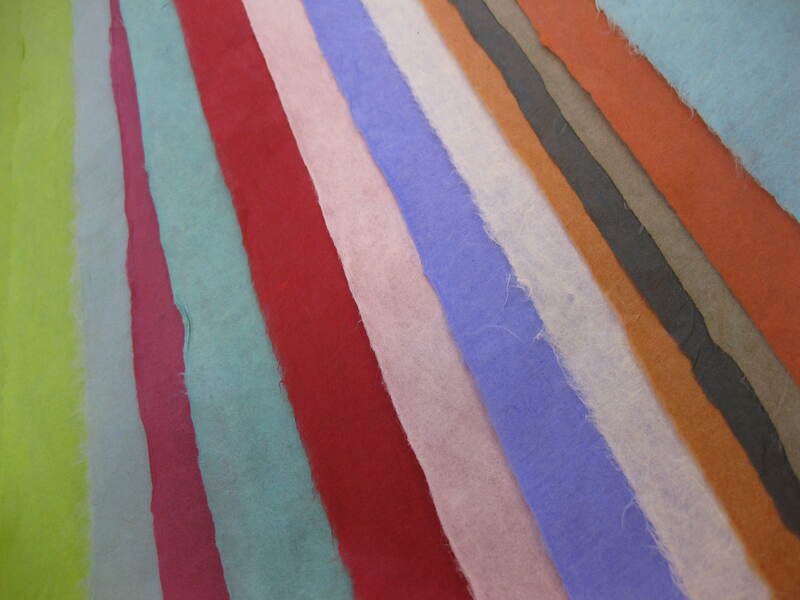 For all those who can’t wait to try this handmade, mulberry paper from Korea, we are happy to provide hanji in a vast array of colors. We have been inspired and influenced by world renowned hanji artists, such as Ms. Jiyoung Chung , author of the book, Joomchi & Beyond, experts and Ms. Aimee Lee, author of Hanji Unfurled. Their passion and expertise has truly educated us in explaining the benefits of this paper to our eager customers. Strong, handmade hanji can be wonderfully woven, tugged, and transformed into amazing sculptural pieces, from clothing to bowls, to fibrous, organic installations that take a life of their own. Ms. Aimee Lee teaches hanji sheet formation, and other hanji paper arts. In fact, she is on her way back to Providence, RI to teach a workshop through Brown University’s Watts Program/JCB Library: Charles H. Watts II History and Culture of the Book Program, this Saturday, April 13th, however, the workshop filled up immediately, there is a waiting list though; for your reference check out this link . In conjunction with the April 13, 2013 workshop provided by Ms. Aimee Lee, Paper Connection International‘s warehouse/showroom will be open from 10am-2pm on Saturday, April 13. Since we are not open to the public, this is a great opportunity to obtain conservation-quality, 100% mulberry papers from Korea, or “hanji”. Paper Connection is located at 166 Doyle Ave., 2nd Floor, Providence, RI (diagonally across from the East Side YMCA). Parking available on left side of parking lot in front of building. Call 401.454.1436 for more information. March has been a very busy month for us. We have been planning for the upcoming Southern Graphics Conference, a printmaking love fest that this year is being held in Milwaukee. So printmaking methods have been in our minds, maybe a bit too much. What papers are best for lithos? Is gampi good for chine colle? , etc. (The answer, by the way, is yes, yes and yes.) However, to take a break from the wonderful world of printmaking, we turn our attention to a different, if not extraordinary application of our papers, by Arlene McGonagle. We have known Arlene for many years; she is a very faithful, loyal supporter of Paper Connection. And we love her unique approach to transforming our sheets of papers into something three dimensional, and even poetic. We will let her explain. PCI: Tell us a little bit about yourself: What kind of artwork do you do? 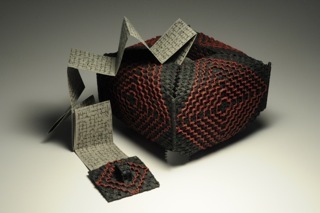 AM: I make baskets – one of a kind sculptural baskets. I have been a traditional basket maker since 1980. I grew up on a produce farm in Hadley, Massachusetts. Baskets were part of our harvesting process in which our vegetables were all harvested using different basket styles. As a young person I was not aware of my passion for baskets, but I do believe growing up on a farm gave me the knowledge for the functional construction aspects of basket weaving. PCI: What or who has influenced and inspired you? AM: After making functional Nantucket and Shaker baskets for fifteen years I needed a methodology in which to become more creative in my personal form of expression. So I returned to college entering The University of Massachusetts at Dartmouth in the Fiber Arts and Textile Design Department for a Masters Degree. As a result my work and materials changed overnight. The Fiber Arts Department encouraged us to use different and unusual materials from barks to wire and everything in-between. AM: The wide variety of texture in paper, I felt the more texture the better in the paper I use. The paper reminded me of the barks, woods, and reeds I had used in the traditional basketry process. However, the paper I chose was colorful with intricate designs and flexible without soaking it in water. It was also gentler on my hands and easier to weave. PCI: That’s great, especially for your hands’ health too! What do you like best about working with paper? AM: For me it’s all about texture and color. I love the thick kyosei-shi paper because it reminds me of fabric. I have been working in neutral colors lately, but this paper allows me to go wild with color if the basket calls for color. I also love the mulberry, or kozo paper for its translucent and regal qualities. When words are written on this paper it adds a note of importance and strength. AM: I had heard about Paper Connection for many years, but did not know it was open to the public. So I called one day and explained that I was a basket artist looking for special textured paper and made an appointment to stop in. PCI: Simple enough. We love your initiative. Did you have much knowledge about Japanese papers before using our papers? AM: I had no knowledge of Japanese papers whatsoever. I fell in love with the papers offered at Paper Connection and sometimes even designed the baskets around the available papers. I learned more about paper variety and function with each visit to Paper Connection. The vast knowledge of the staff and the wonderful stories Lauren would tell about the makers of the paper helped me to realize that the paper was almost sacred and that my designs had to live up to the value of the papers I purchased. PCI: Wow. We’re so happy and grateful to hear that. What a testimony to the artistry of the papermakers themselves! What are some of the differences between our papers and others you have worked with? AM: I seem to keep going back to Kyosei-shi for most of my basketwork. It is physically strong and with a wide variety of colors. However, I can buy it in off-white and dye in the colors I need. I don’t know if I could dye other papers in a water bath. PCI: So to sum up? 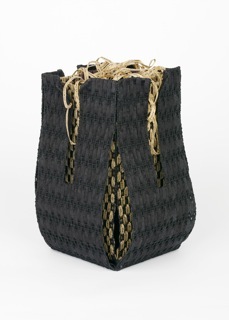 AM: I like kyosei-shi paper because it is strong and textured like fabric for my baskets; it is flexible and does not tear when I weave it with wire. PCI: Arlene, thank you so much. We love your work, we appreciate how you use these wonderful papers, the motivation behind it, and your generous support over the many years. For more information about Arlene, please visit her website, Basket Sculpture. Her studio is located in beautiful Warren, RI. 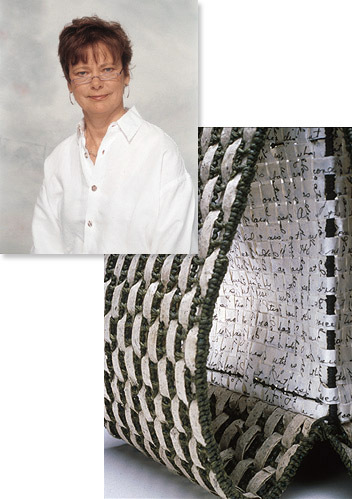 To read more about her work, Arlene was featured in the Fall 2012 issue of the National Basketry Organization. Article courtesy of Arlene McGonagle. Out with the (c)old, in with the new (season). I am always anxious to bring in spring; my favorite season…especially after the Blizzard of 2013 in the Northeast of the US. 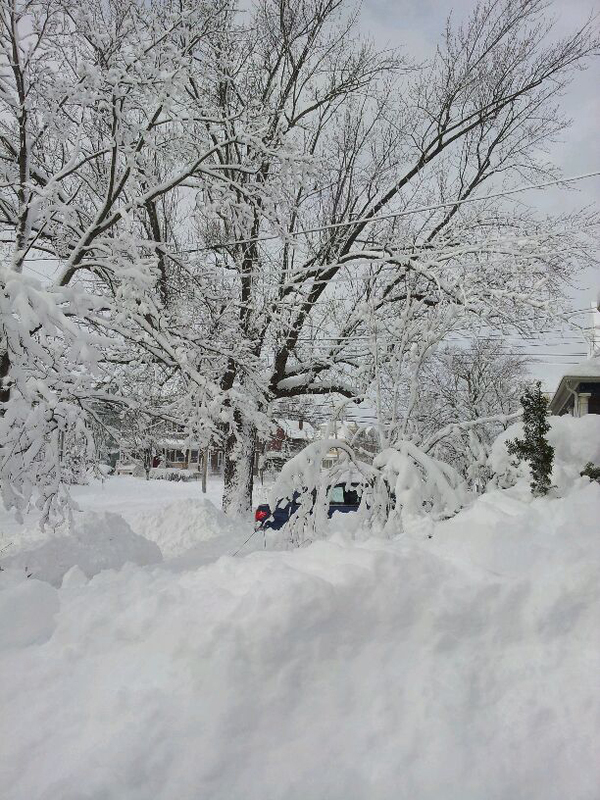 Blizzard 2013:Rhode Island February 9th. This year on February 2nd, I was lucky to witness the Setsubun ritual at my local shrine in my other neighborhood in Japan. The tradition of Setsubun no Hi or Setsubun Day is all about welcoming the spring. When the idea came to Japan in the 18th century, it was incorporated into Japan’s native religion, Shintoism. But Setsubun originated in China is performed before the Lunar New Year. In Japan, Setsubun is an annual Shinto ritual. Beans are thrown as a symbol to shoo out the evil spirits from the past year and thus welcoming in the new season; spring. 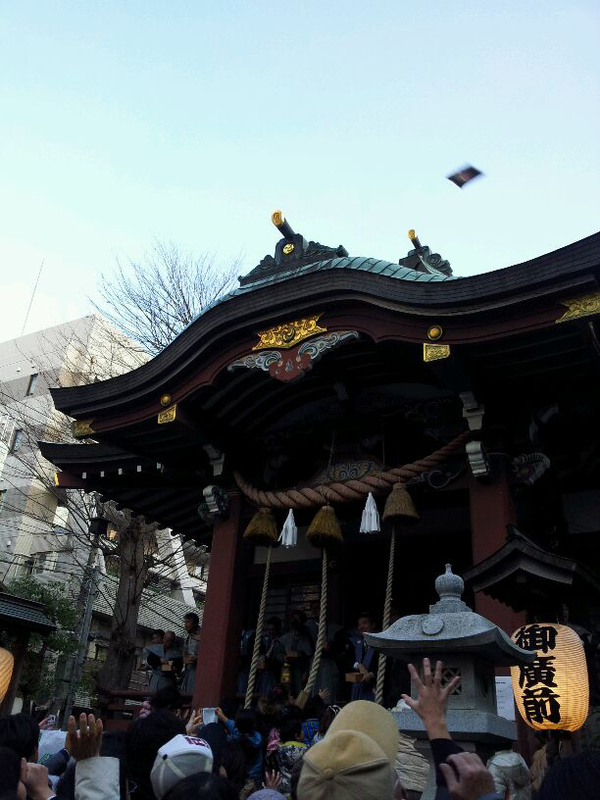 After a purification ceremony is performed, including waiving folded white paper (gohei), the Shinto priests toss good luck coins into the crowd; 5-yen or 100-yen coins. While I was taking photos of the ceremony, unbeknownst to me a 100-yen coin landed in my shoulder bag! I thought I heard something fall in, but I didn’t find it right away. I guess that means 2013 will bring me lots of good luck! Setsubun is surely full of superstition, as it based in Japan’s original religion Shintoism, which has plenty of good and evil spirits in every animate and inanimate object. You must admit though, that American culture has some pretty superstitious rituals. Consider the same time of year-February 2nd, Ground Hog Day! Most notable is that both Shinto practices and the idea of having a ground hog predict the weather are strangely related; both customs are based in ancient nature worship and animism. For now I’ll cross my fingers that we won’t have any more blizzards this year and eat a few more sweets with the Chinese character of “snake” ensuring 2013 is truly a good-luck, snake year. Welcome to a new feature of Where is Paperwoman? Our Artist of the Month series focuses on an artist who not only loves paper, but implements it in his or her work to astonishing effect. Of course, we may be biased that they use Paper Connection’s paper, but regardless, their vision, approach, and resulting work are most worthy to share with you, our dear readers. This month, we chat with Barbara Green, our neighbor, colleague, and friend. She is an established artist, residing in Rhode Island by way of Germany, having attended school in Chicago and Ohio. Barbara is a longtime member of 19 on Paper, an organization of Rhode Island artists whose works are either of or on paper. She has shown in numerous galleries, museums, corporations, with her collections displayed at various universities, hospitals, and other institutions. PCI: Tell us a little about yourself, Barbara; what kind of artwork do you do? BG: Paint, watercolor, oil stick, paper for installations, weaving (shifu). Ripples, cut out with black and white kozo. A 3D Shifu drawing by Barbara Green. PCI: What or who has influenced and inspired you?BG: Paper as a medium; Sargent, Homer, Japanese scrolls and prints, contemporary fiber artists, and nature. BG: The feel of paper in its various forms: wet, cut, or twisted. PCI: Sounds wonderfully tactile. What do you like best about working with paper? 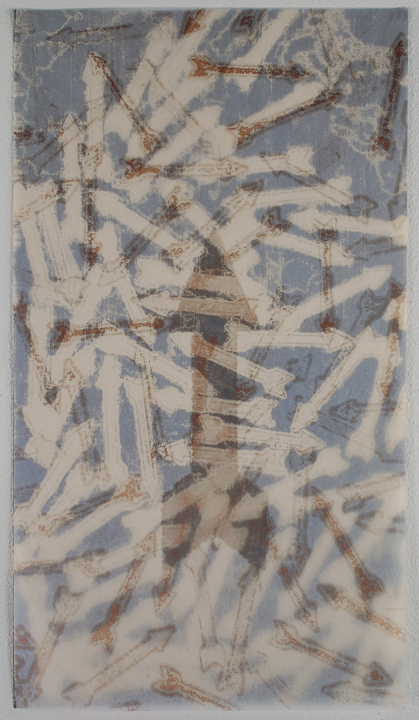 BG: Paper has the seemingly unending possibilities to create, from being a surface for painting to a sculptural medium. BG: I was searching for special paper and I also heard about PCI from a friend. PCI: Did you have much knowledge about Japanese papers before using our papers? PCI: So how did Paper Connection help you choose and inform you about Japanese paper? BG: Lauren Pearlman and the staff had great advice. PCI: Thanks, we try our best! 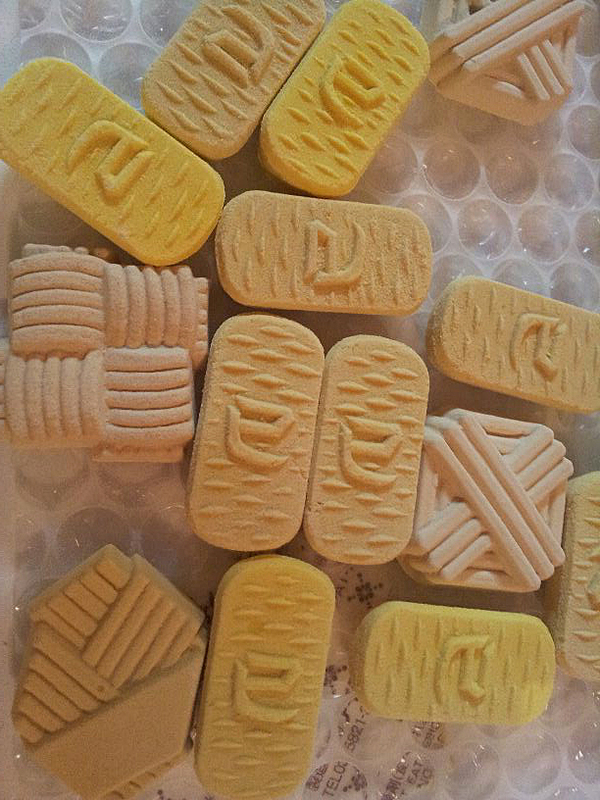 What papers do you use of ours and for what process? BG: I use sheets and rolls, depending what I am working on. PCI: That’s right, I remember you purchasing a white striped, (sudare pattern), Lace paper roll and transformed it into a beautiful, graceful installation. 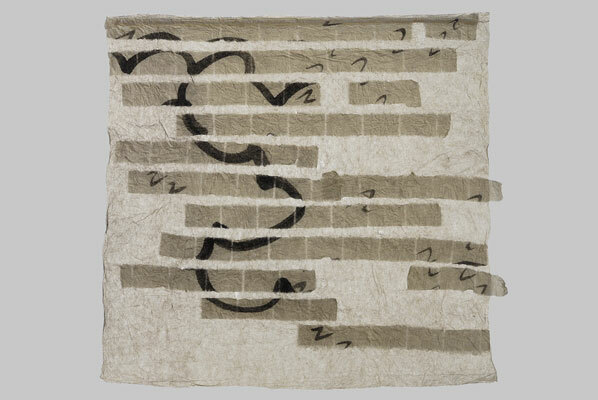 Barbara’s use of Sudare, or striped, Lace paper. What did you like about those papers that aided in your creative and/or technical process? BG: The high quality, strength, and beautiful colors. BG: Western papers are designed for a specific purpose, like watercolor papers, printing. Papers that PCI carries can be used in many ways, not only traditionally. BG: I like your various kozo paper for strength because it is very versatile and comes in various weights and sizes, as well as colors. PCI: Bonus question: If you could have a conversation with any artist past or present, who would it be? And would you talk about paper? BG: The National Treasure paper makers from Japan. Definitely! PCI: Certainly they would like to speak with you too; I would love to be a fly on the wall when that happens. Barbara, thank you so much for your time and sharing with us your insight into your work and paper. 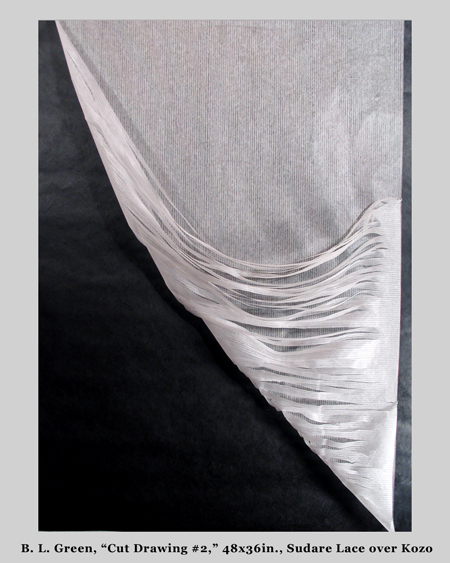 Winter River by Barbara Green, black kozo over white kozo. Flight. Paper installation, courtesy of Barbara Green. Portal: 16 sheets of Japanese lace paper (Sudare) cut and suspended from 16 sticks, courtesy of Barbara Green. Close up of “Portal”, courtesy of Barbara Green. If you are interested in being featured for an upcoming “Artist of the Month”, please contact us at 401-454-1436. Thanks! 2012 over!?! That was amazingly quick. I guess I do spend much of my time on the road and it is clear traveling or rather “not being home” speeds up time! To switch things up in my dual-life pattern, I spent the fall of 2012 in the East Coast of the US for a change. First DC, then Cleveland (noted in the previous blog. Early November started with a bang, with one the best Paper Connection Annual Holiday Warehouse sales ever! Then, more excitement by mid-November, as my staff and I organized a 4-day visit from a Paper Rock Star guest-Ms. Aimee Lee in Providence, RI. We had an awesome turn out for Ms. Lee’s hanji talk, demo and new book signing: Hanji Unfurled. After Ms. Lee’s successful visit to Rhode Island, I got to enjoy a “real” Thanksgiving with relatives, turkey and pies; it had been many years! Surely a day to recognize all that we have and all that we have in abundance. November, 2012 was certainly packed full with a cornucopia of accomplishments; I am very thankful, no matter what month it is. By December, 2012, my suitcase was re-packed, and currently I am back on the other side of the globe. Since I’ll be on the road again shortly; heading to Seoul next week, I thought I would turn to TWO past abundant Novembers. Reflecting back as time springs forward. November, 2011: Journeyed north to Tokohu- the Northeast of Japan: For several reasons, this voyage to Tohoku was quite meaningful, especially post the March 11, 2011 disasters. The main goal was to check on my very good friend, who had moved back to the Tohoku area on March 1, 2011, I hadn’t seen her family since 1986. My friend warned me that all the coastal places we visited in 1986 “ARE GONE”, she wrote days after the tsunami hit. Another reason for going to Tohoku was to get a sense of the general post 3.11 feeling of the Tohoku survivors, where so many mingei-folk arts are/were born. The bonus of this trip was visiting with Mr. Koichi Odanaka at his studio. It was my privilege to meet Mr. Keisuke Serizawa’s last apprentice. I thoroughly enjoyed the back stories Mr. Odanaka told of his life with Mr. and Mrs. Serizawa in Tokyo. So it was a gratifying trip- educational and moving at the same time. Odanaka’s work is truly irresistible. Although, it’s not something I stock at this point, I would like to support as many artists as possible in the Tohoku region of Japan. Let me know if you’re interested in any of his work; I’ll see what I can do! Here are a few of his stenciled items I purchased: calendar and textiles. November, 2010: Traveled, by plane, to Toyama-ken for the first time ever. For centuries Toyama was known as the main pharmaceutical producing area of Japan. Back before plastic bottles with cotton stuffing, all medicines were wrapped with washi. The area was previously known as “Etchu” so the paper from the area is called “Etchu Washi”. Of course, the need for washi dropped off with the invention of new packaging, but a young Mr. Yoshida, moved back to his hometown of Yatsuo, giving up a city life and a city job to start a washi-making mill in the small, well-preserved town of Yatsuo, not too far from Toyama City. Mr. Yoshida knew he had to make paper for new uses, so he decided to make kozo paper for artwork. Mr. Yoshida befriended the katazome master himself, Mr. Keisuke Serizawa, while he was working up at Ogawamachi in Saitama, making his own paper for his stencil work. 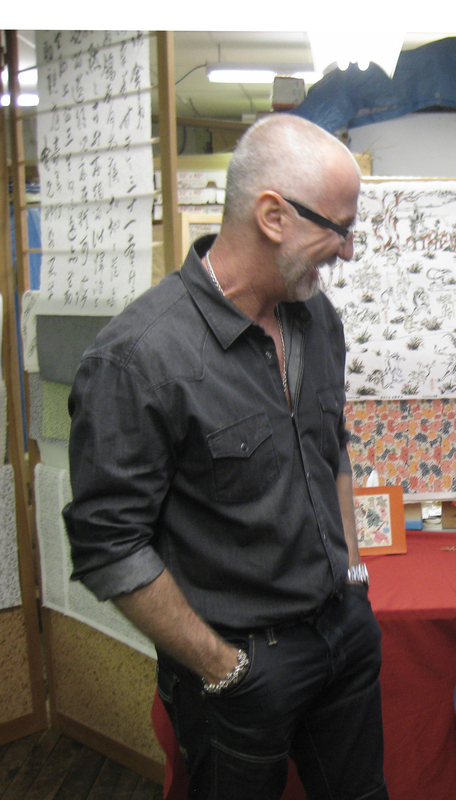 Mr. Yoshida convinced Mr. Serizawa to try some Yatsuo paper (Etchu Washi) for his stencil work. From that point forward, Mr. Serizawa used the kozo paper made at Mr. Yoshida’s newly fashioned mill. It was a start of what would become a long business relationship and friendship. Both the Yoshidas and the Serizawa’s had a deep connection with mingei and both had the passion to carry the tradition of washi and katazome into the future. Currently, the next generation of the Yoshida family run a paper shop, mill and incredible folk art museum, which houses the collection of the Yoshida parents. Thanks to the friendship between the Yoshida family and the Serizawa family, this Yatsuo operation called Keijyusha continues to produce decorated katazome papers, stationery items and collectible calendars employing Serizawa’s original stencils. 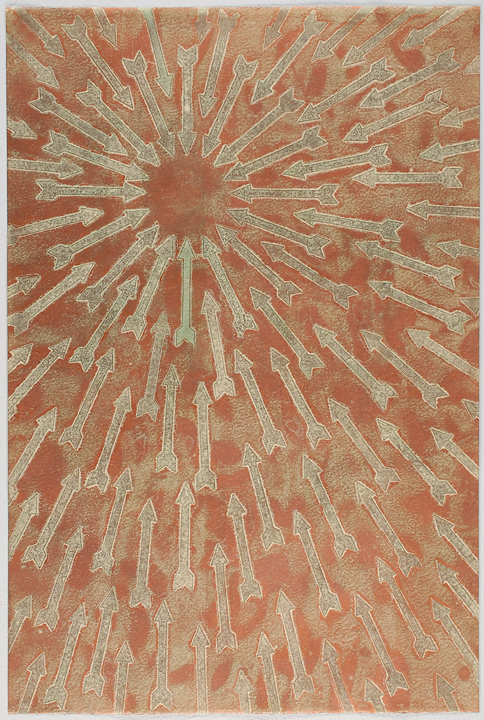 kakishibu paper “rug” in Museum. There are still a few 2013 Serizawa desk calendars for sale at Paper Connection and many beautiful items in stock and for sale from this precious operation in Yatsuo. Please call us or email us for more information. Serizawa Calendars and Serizawa stencil biz card holders. etc. Joomchi! Everybody’s talking about it! Korea claims a unique and intriguing art called joomchi. How do you go about making joomchi? It’s easier to try with your own hands than to explain in words…but here it goes. This is my beginner’s understanding of the process: At least 2 layers of Korean mulberry paper, or hanji, are first wet, then, aggressively gripped, grabbed, stretched, and manipulated until the fibers are broken down and almost “felted” to your liking. Hours of aggravating the paper are expended, while possibly years of angst is relieved. 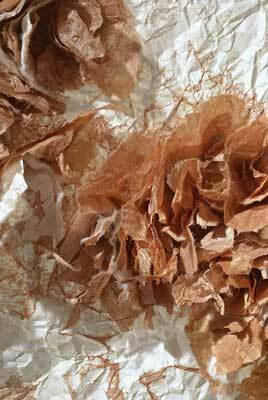 A major transformation occurs; once flat sheets of paper become a very organic, leather-like, almost living form. No adhesives are used, however, natural dyes, pigments, other papers, fibers, and cloth can be “collaged” in to create a very special mixed media paper art. We learned that Japanese mulberry paper (kozo) works fine for making joomchi, as our colleague Barbara Green tested it. She used Paper Connection’s senkashi (a heavy weight un-dyed kozo paper, traditionally used for clothing) and some vintage, pigmented kozo. I finally made it to the nearby Atrium Gallery in Providence to see one of their latest shows: Joomchi and Beyond, curated by Ms. Jiyoung Chung. 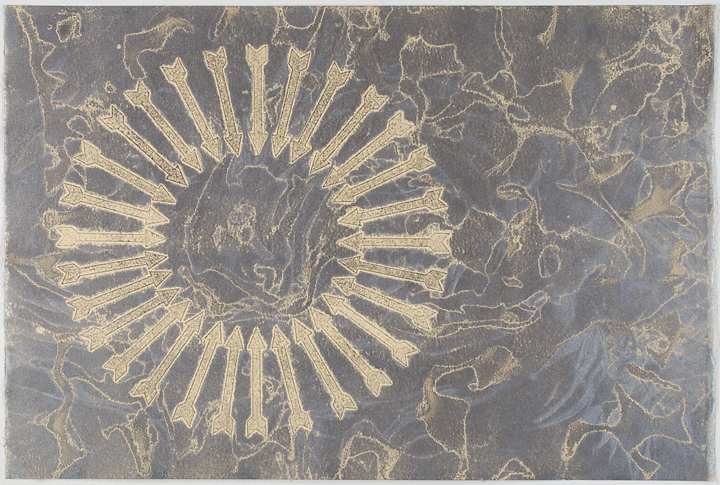 I blogged briefly about Ms. Chung and her exhibit at the Minnesota Center for Book Arts, last June, 2011. 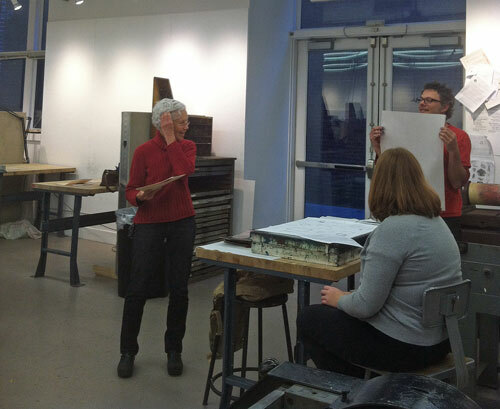 Subsequently, I was lucky enough to attend her workshop early spring 2012. Many of the works shown at the Atrium are part of Ms. Chung’s fantastic book also entitled Joomchi and Beyond. Please see Jiyoung’s book for photos of her method and process. She is a great teacher. For more photos of the show, click here. Another artist who works with hanji and creates joomchi is Aimee Lee. It is truly amazing when you think that no adhesives are used, and all the papers are transformed by hand technique alone. Ms. Lee is just out with her new book Hanji Unfurled, which details her research and works on hanji. Can’t wait to meet her in 2 weeks at the Morgan! Aimee is also planning a book signing tour in New England in November, thus I’m hoping she will come to Providence and Paper Connection, of course! Who’s in for meeting Aimee Lee and talking paper?!? !